In last week’s post I talked about how hypnosis is a natural state we all go into; while watching TV, while driving, while exercising, before we go to bed and right after we wake up. That attached diagram, (courtesy of the Hypnosis Motivation Institute) is what I use with every new client to explain how hypnosis and hypnotherapy works. From the time we are born until about 8 years old, we are very suggestible. That just means that we take in everything as absolute truth. As children, we do not have the ability to analyze incoming information; we believe everything we are told. Most kids are walking around in hypnosis. We learn likes and dislikes, what we are capable of, what we are not capable of, what is fearful, desirable, etc. This is the creation of our so called Life Script: a collection of beliefs and “knowns” that shape our behavior and thinking. This happens at the level of our subconscious mind, so we are not aware that it is occurring. We all fall under the hypnosis of our culture, and adopt the beliefs of our parents, religion and society. Between 7 and 9 years old, we begin to develop the “critical mind” which blocks suggestions into our subconscious minds. We began to question incoming information, we began to ask why, and to seek to understand the information presented to us. At this point we begin to develop our conscious minds, which we use for decision making, reasoning, analyzing, and logic. We start to think for ourselves. 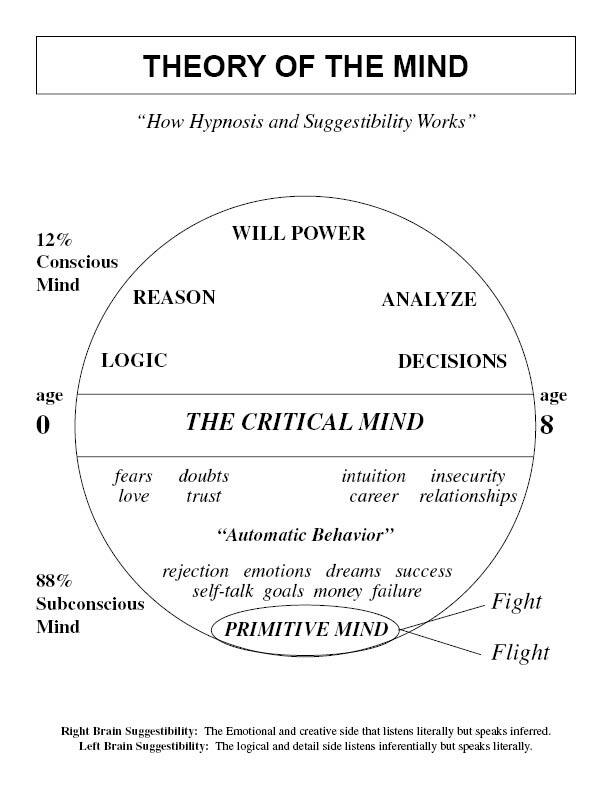 As you can see from the diagram, the subconscious mind makes up 88% of our total “mind power” according to some estimates. The conscious mind, only about 12%. The subconscious mind has a much greater influence on our behavior. What brings people into my office is the realization that they have a problem that they cannot seem to solve on their own. For instance, they can’t quit smoking, or get rid of anxiety or get motivated. 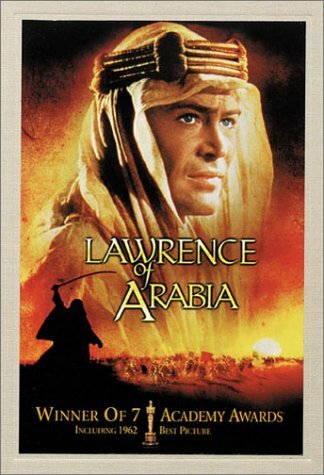 Their subconscious mind is familiar and comfortable with smoking, to the subconscious, it’s a “known”. So even though they may want to quit smoking, the part that wants to quit is only 12 %: the conscious mind. But 88% wants to keep smoking. Which do you think will win out? Of course, the 88%. Hypnosis as a tool for change. This is where hypnosis comes in. When a person is in hypnosis, their critical mind, whose job is to be the gatekeeper to the subconscious mind, takes a break. They become very suggestible, or, open to suggestion. So in a hypnotherapy session, I can use the power of suggestion to get the subconscious mind familiar with what the goal is, so that the goal now becomes a “known” to the subconscious mind. With enough repetition and reinforcement, by coming to a few sessions or listening to recordings that I make for my clients, they can begin to reprogram their minds to stop smoking, be more calm and relaxed, or be more motivated. See how that works? I specialize in helping people quit smoking, release anxiety, and get motivated! If you want to know more about how I can help you, click here to contact me. I can help you change your mind one thought at a time! https://tedmoreno.com/wp-content/uploads/2014/09/theoryofthemind.jpg 792 612 Ted Moreno https://tedmoreno.com/wp-content/uploads/2018/05/The-Moreno-Method.jpg Ted Moreno2014-09-10 07:00:262018-05-30 20:02:23Hypnosis 101: How Does It Work? But if you are a smoker, and want to quit smoking, you know that quitting smoking is no joke. It can be very hard. The dangers of smoking are well known. Since May is National Health and Fitness Month, I’d like to provide some tips to help you quit smoking. If you don’t smoke but know someone that does, please forward this to them. It might just save their life. Ready to quit smoking on your own? Here are some tips to increase your chances. Have a plan. To quit smoking, you must be prepared. Pick a goal date when you will smoke your last cigarette and start your life as a non-smoker. Between two weeks and 30 days from today. Get a physical. Be aware of any health problems that may exist. It’s better to know. Make sure it’s ok for you to exercise. Get regular exercise. Get your health back. Walking is a great way to start, riding a bike or doing exercise videos at home. Exercising will also help you deal with negative feelings that may arise in your first days of quitting. Write down all the reasons why it’s so important for you to quit smoking. The more emotional, the better. (“I don’t want my kids to watch me die of lung cancer” for example.) Write your reasons down on a few 3×5 cards and carry them with you. Put them up where you will see them. Read them several times a day. Change your diet. Since nicotine acts as an appetite suppressant, you don’t want to gain a bunch of weight after you quit smoking. (Very common after folks quit smoking.) Start to eat three healthy meals a day with healthy snacks in between. Increase protein and reduce refined carbs. In your preparation period, start to scramble your smoking pattern. For instance, if you smoke in your left hand, start smoking in your right. If you like smoking on the front porch, change your smoking spot to some uncomfortable place like out by the trashcans. Stop buying cartons and buy one pack at a time, changing brands each time you buy a pack. Start cutting cigarettes in half. Find ways to stay busy to keep from being bored. At work instead of a smoke break, take a short walk. Keep your mouth busy using sunflower seeds in the shell, gum, sugar free suckers or hard candy, licorice, carrot sticks, celery sticks, pretzels, flavored toothpicks. Some people say that putting a Listerine slip in their mouth takes away the urge. Drinking milk works too. Keep your hands busy with a stress ball, or an object you can keep in your hand like a pen or small stone. Take a Vitamin B supplement to help with stress. Use the nicotine patch, gum or prescribed smoking cessation meds if you need to, they are much more effective when used in combination with the techniques I’m giving you here. Use affirmations. Use positive self talk such as “I am free!” or “I can do this” or “I am in control” or I’m worth taking care of ” or “I am healthy, happy and free from addiction.” Make it a habit to say them several times a day. ON YOUR QUIT SMOKING DAY: Tell everyone what you are doing to make yourself accountable. Pick your quit day carefully; a day when you have time to focus on your goal. After you quit smoking, avoid drugs like alcohol and marijuana which can decrease your motivation. I suggest giving them up at least for the first month of being a non smoker, longer if they are major triggers that make you want to smoke. If coffee makes you want to smoke, cut down or eliminate it for a while. Get lots of sleep. You body needs energy to heal. Get your car washed and detailed if you smoked in your car. Avoid situations that will tempt you. Stay away from bars and parties where people will be smoking. Ask those close to you to refrain from smoking in front of you. Give yourself a reward. Have a plan to get a massage after 30 days of smoke free. Or take a trip. Or buy something for yourself. DON’T KID YOURSELF! Don’t even think for a second that you can have “just one” after you quit. Chances are you can’t. “Just one” can undo all of your hard work. Begin to see cigarettes for what they are: a deadly poison that you want to stay away from. three times as effective as nicotine replacement therapy, according to a a study presented October 22, 2007 at the annual meeting of the American College of Chest Physicians. I offer a four session “Freedom From Smoking Forever” ® program using hypnosis and hypnosis recordings for listening at home. Research shows that using hypnosis to quit smoking can be up to 66% effective when 4 or 5 sessions are used in a 6 to 12 month period. Your health is the most precious thing you have. If you are ready to quit smoking and want more information about my smoking cessation program, you can request a free consultation by clicking here. Dante Gabriel Rosetti was a famous 19th century poet and artist. One day, he was approached by an old man. The man had some sketches that he showed to Rosetti . He wanted Rossetti to tell him if they were any good. Looking at the drawings with his expert eye, Rosetti knew right away that they showed no sign of artistic talent. He told the man as much in the most kind and gentle way he could. The elderly man seemed disappointed but accepted the artist’s verdict. “May I ask for once more for your opinion?” asked the old man as he showed Rosetti the work of a younger artist. Rosetti agreed and looked over this new set of artwork. This time, however, he could see incredible talent and potential in the drawings. “These are quite good,” said Rosetti. “This student possesses great talent. If he works hard at his art, his future will be bright. He should be given every opportunity and encouragement to succeed as an artist. The old man became silent upon hearing these words. “Is this young artist your son?” asked Rosetti. The hypnosis of belief is the invisible hand pulling upon your strings. It will determine what you do and don’t do. All belief is a form of hypnosis. If you are told something enough times by someone you trust and believe, you will accept it as fact and act accordingly. If you believe making lots of money is a sin, then you will stay poor. If you believe that your cause is worth fighting for, then you will fight and maybe even die. If you believe you can, you will. If you believe you can’t you won’t. There are few universal truths that stand on their own. Almost all of what we hold to be true is true only because we believe it. We are under the hypnosis of belief. Our beliefs are mostly created by ideas given to us again and again by authority figures such as parents and teachers. It’s not long before we can only see the experiences that support and keep those beliefs in place. Once you understand the hypnosis of belief, and that all belief is hypnosis, then you accept that your belief is not truth and is subject to change. So now, you are free to believe whatever you want, as long as it works for you, which means that your belief influences your actions in a way that gives you the life you want. Second point: you get to evaluate and choose what beliefs work for you, and in the process, let go of beliefs that don’t resonate with you any longer. You understand that as you grow in wisdom and experience your beliefs should change. Third, and most important, you become cause in the matter of your life. You become the creator of your life. You become responsible for your own beliefs, because you chose them. Then, based on those beliefs, you behave or take actions in a way that creates the life you desire. However, most folks have it backwards. They take actions that don’t work, based on the hypnosis of beliefs that are outdated and no longer in alignment with their desires. This is a recipe for frustration and unhappiness. I’m too afraid to do that. These are all beliefs that when taken as truth, will stop you cold. Changing those beliefs can allow you to move forward. I challenge you to try this exercise. Write down all the things you believe are true. Write down your most cherished beliefs. Next to each one, answer the question: how do I know this? Examine, and question each one. If it’s time to let one go, do so. If it works for you, keep it. If it’s something you need to think about some more, then do that. You will probably never free yourself from the hypnosis of belief, but you can be aware of it and make it work for you. The most important thing is to be awake and refuse to abdicate your own authority to anyone or anything. This is your life. You get to choose what to think and believe. Choose wisely. Belief: The Tie That Binds, The Wings that Soar. 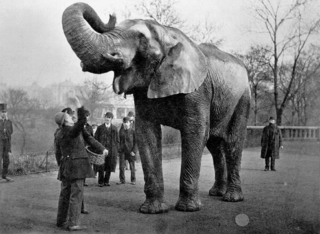 The man approached the elephant trainer and inquired as to the skimpy method used to hold the elephant. The man walked away shaking his head. One of the world’s strongest animals, able to uproot trees and destroy villages, held captive by a skinny chain and a small wooden peg. The parable of this story is obvious. As human beings, we are often no smarter than elephants. We believe in limitations that keep us prisoners. We hold painful memories that keep us taking risks. Because we have failed once or twice, we have stopped even trying. You have to cut elephants some slack. As big as they are, their brainpower doesn’t even compare to what we have under our hood. We should know better. But we often don’t. We treat our self imposed limitations as truth. But they are not truths. They are simply beliefs about what is possible for us. And your beliefs can change. Now. Today. After ten years in private practice as a hypnotherapist, I’m still amazed by the power of belief and it’s ability to bind us or set us free. I’ll be examining the power of belief in the next few posts. I’d like to hear about how your beliefs occur to you and how your beliefs have changed if at all. I invite you to step back and see your beliefs as beliefs instead of truth and what impact they have on your life. Please share your thoughts in the comment section. https://tedmoreno.com/wp-content/uploads/2014/02/320px-Jumbo_and_Matthew_Scott.png 234 320 Ted Moreno https://tedmoreno.com/wp-content/uploads/2018/05/The-Moreno-Method.jpg Ted Moreno2014-02-26 22:12:022018-05-30 20:43:25Belief: The Tie That Binds, The Wings that Soar. I was recently interviewed on Just Believe Radio by Lisa Tarves discussing hypnotherapy related topics as well as my book. To listen to the interview click here. The interview starts at 9:22. Want to listen to other interviews I’ve done? Click here. Hi, Ted Moreno, hypnotherapist here. I have finally launched my new website at tedmoreno.com. The new site integrates my website with my blog site. Please check it out, I welcome any comments or suggestions. My goal is to soon offer downloadable mp3 hypnosis recordings as well as hypnosis and motivational CDs. You can comment in comment section under each post or comment by clicking on contact. To go to my blog, just click on Blog. Special thanks to Tom Kitti of Local Marketing Boost for putting it all together.